1. 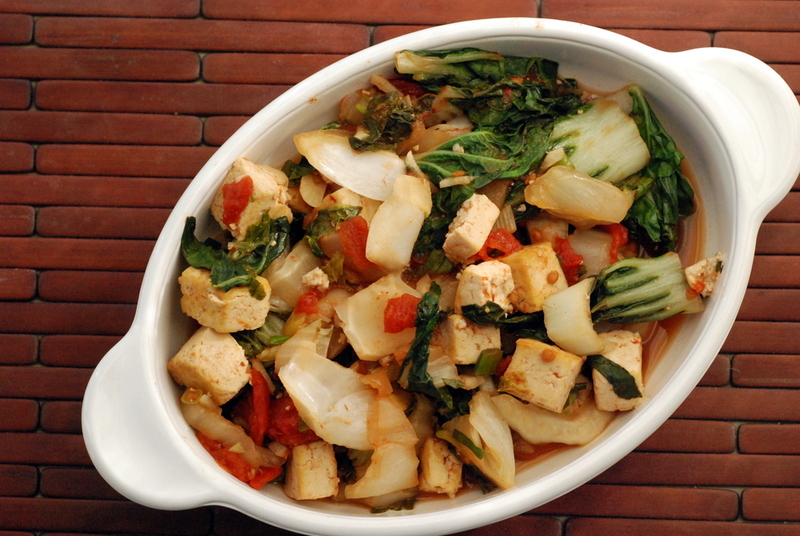 In a large non-stick wok over medium-high heat, dry-fry tofu until it is brown on most sides. This will take around 3-5 minutes per side. 2. 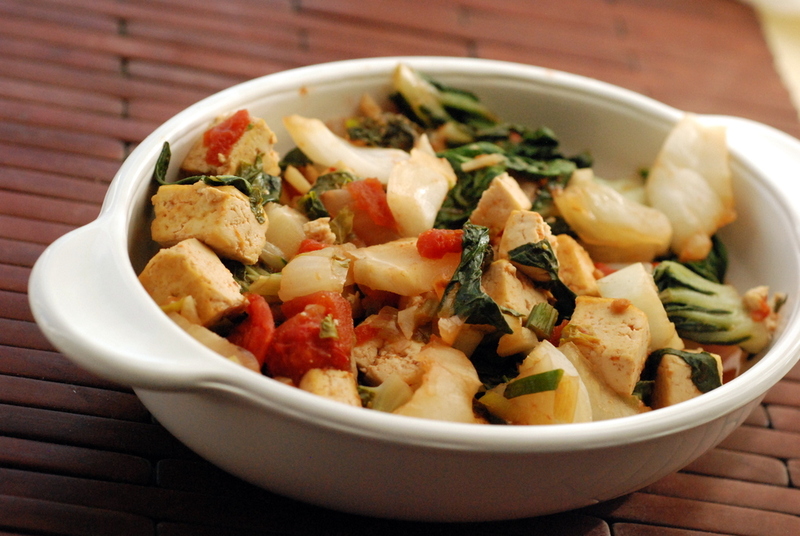 Stir in baby bok choy stems and cook for 2-3 minutes until slightly cooked. 3. Stir in tomatoes, green onions, garlic, nutritional yeast, tamari, chile flakes and reserved canned tomato juice (or vegetable broth). 4. Once well mixed, stir in the baby bok choy leaves and cover. Cook for 3-5 minutes until the leaves are cooked through. Stir occasionally. 5. Drizzle with toasted sesame oil and serve with your choice of grain – brown rice, quinoa, etc. Serves 4 with side of rice or quinoa (or serves 2 as a main). If I eat too much soy I get really bloated, but strangely enough beans don’t affect me. I have a pretty strong stomach though. My best friend has IBS. We hsared a hotel room on a vacation to San Fran. We ate too much, dranks too much… and she nearly ran me out of the room more times than I can count. LOL! One of my running friends has IBS and she tried a diet similar to this…unfortunately I think so much of IBS is caused by your emotions/stress level that some days it worked and some days it didn’t…which I guess means that it didn’t really work lol. I’m just glad I don’t have it! 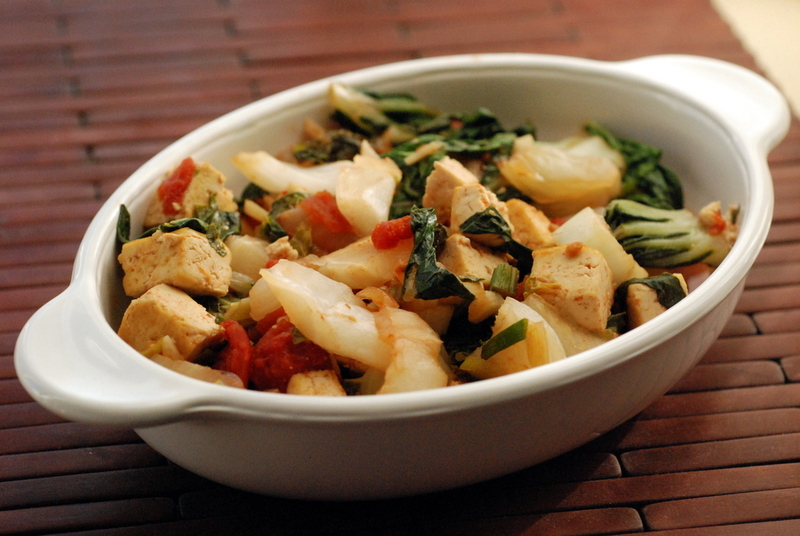 And this meal sounds super tasty whether you’re on the FODMAPS diet or not! I remember reading a lot about the FODMAP diet a few years ago when I was experiencing serious GI issues, but I ultimately found as a vegan it was really hard to stick to! I’ve found over time just gauging how I feel to certain foods to be easier, rather than following a diet. And I react not so great to many things that are FODMAP friendly like peppers and oranges, and bigger amounts of stevia. Ahh well we are all different I suppose! Haha those songs are ridiculous, how have I never heard of them before??? As much as I’m loathe to get on board with anyone self-diagnosing very restrictive diets, Monash Uni/Australia REPRESENT. Haha, you are too funny.. but yeah. I never really thought of it that way. Good point. An other problem is gluten taken from OGM meal, as far as I know, this kind of meal is stronger than our traditional meal and we’re not able to digest it correctly, so a lot of people start suffering for gluten-sensivite. It’s a very interesting post this one, thanx for sharing it! Here you’re the link to the WHB, thank you for taking part with your recipe! greetings from Tuscany, Simona!